The largest region in Thailand is a landlocked conglomeration of 20 northeastern provinces. At 65,200 square miles, it's a bit smaller than Wisconsin. We'll spare our typesetters the challenge of printing its authentic name, four Thai characters, noting instead that its English-language name has been transliterated as Esan, Isaan, Isan or at least four other ways. Many visitors to Portland, Oregon, have already fallen in love with Isan's whoppingly flavorful cuisine, as chef Andy Ricker's restaurant Pok Pok took American-foodie culture by storm in 2005 and expanded into Los Angeles and New York. In Ricker's essential 2013 cookbook, also named Pok Pok after the sound made by a wooden pestle in a clay mortar, he describes his experience of trying Isaan food for the first time. "It was like seeing an entirely new color," he said. "It was nothing like anything I had eaten before." Isaan dishes are ably represented in Tacoma, at Jeremy and Maam Ray's Loak Toung Thai (3807 Center St.), among other popular eateries, but Thurston County residents have not been so lucky. That changed this month. Lacey diners can now explore these bold, exotic flavors as well, thanks to chef Ron Boonkue and E-San Zap Café in Hawks Prairie. Even for fans of central-Thai food, ubiquitous in the Pacific Northwest, Isaan street-vendor cuisine might come as a stunning surprise. It leans heavily on glutinous rice, green papaya and nuclear-grade chiles. If a server at E-San Zap intimates that a "two-star" dish packs a wallop, delicate diners are encouraged to take that counsel seriously. On a recent visit, we spotted some pretty obvious, opening-month service issues, especially with respect to cocktail orders on a not-so-busy Friday night. Having said that, E-San Zap Café's food was unfailingly fresh and delicious. Moreover, its flavors all swung for the cheap seats. They were cranked to 11, not just with respect to the heat of Thai chiles but the sweetness of a mango cocktail, the sourness of tamarind pulp and the umami of fish sauce as well. Pok Pok's bestselling dish is its Vietnamese-style, fried chicken wings dripping with sticky, savory fish sauce. At E-san Zap Café, the chicken-wing appetizer is chunky but crispy, undressed but accompanied by Thai sweet and sour sauce. The blanket shrimp appetizer, meaning prawns wrapped in rice paper and fried, is joltingly savory. House cocktails run the gustatory gamut from the sugary, abovementioned "Mango Madness" to jalapeño spritzers we found too fiery for comfort. Isaan cuisine offers a plethora of tasty salads, meant to be eaten at any point during the meal. (Isaan desserts should also be enjoyed at whatever moment a sweet treat feels most desirable.) On that front, Boonkue's shredded-papaya salad, som tum pu, slammed our palates with salty, savory black crab and fish sauce. For a mellower pillow of luxurious, crustacean sensations, try E-San's crab fried rice, our new favorite comfort food. 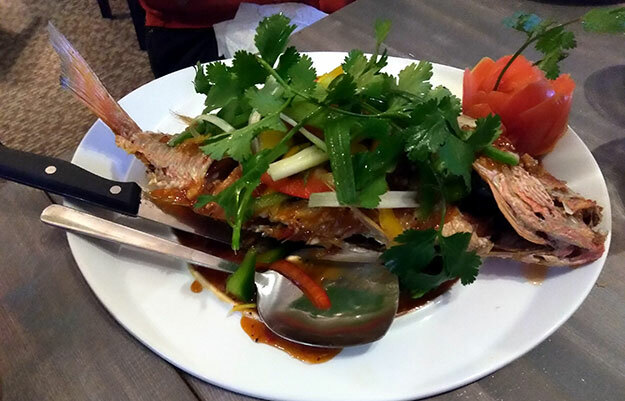 We sprang for the nightly special as well, a red snapper whole-fried and sauced to perfection. E-san's red curry laden with duck was so rich it brought Mexican mole to mind. E-San's website boasts, "We cook. People rhapsodize." That's a bold statement, but we wouldn't be surprised if adventurous diners were soon agreeing in droves. If minor issues of service can be resolved quickly, we might just be looking at the start of another Ricker-style culinary empire.